This is a scalable context timeline. It contains events related to the event March 2000: German Intelligence Places Two 9/11 Hijacker Associates on a German Watch List. You can narrow or broaden the context of this timeline by adjusting the zoom level. The lower the scale, the more relevant the items on average will be, while the higher the scale, the less relevant the items, on average, will be. Said Bahaji in 1995. [Source: Public domain]German intelligence places two members of the al-Qaeda Hamburg cell, Mounir El Motassadeq and Said Bahaji, on a German watch list. The two men, associates of future 9/11 hijackers Mohamed Atta, Marwan Alshehhi, and Ziad Jarrah, had come to the Germans’ attention because of their association with al-Qaeda recruiter Mohammed Haydar Zammar, who they meet regularly. The watchlisting means that their arrivals and departures to and from Germany will be reported immediately. [Der Spiegel (Hamburg), 2/3/2003; US Congress, 7/24/2003 ] Hamburg cell member Mohammed Haydar Zammar is also placed on a watch list at some point before 9/11 (see Before September 11, 2001). El Motassadeq was first investigated by German authorities in 1998 (see August 29, 1998). Bahaji was the target of a surveillance investigation starting in 1998 as well (see (Late 1998)). Bahaji may have recently traveled to Afghanistan with some associates using a route monitored by European intelligence agencies (see Late November-Early December 1999). Al-Qaeda Hamburg cell member Mounir El Motassadeq leaves Germany for Afghanistan and his travel is immediately reported to the German authorities because he is on a watch list (see March 2000). El Motassadeq flies from Hamburg to Karachi, Pakistan, via Istanbul. At least two of the future 9/11 hijackers have previously traveled this route to Afghanistan (see Late November-Early December 1999). Although Turkish intelligence is aware that radicals from Germany travel to Afghanistan via Turkey, it is unclear whether they pick up the travel by El Motassadeq (see 1996). There are two versions of German intelligence’s reaction to this trip. An early 2003 article in Der Speigel will say that the intelligence report only gives El Motassadeq’s destination as Istanbul, so there are no consequences for him. However, a later article in Stern magazine will say, “Naturally, the officials know that Istanbul is not his real destination but only the usual stopover on his way to Afghanistan, to the camps of Osama bin Laden.” [Der Spiegel (Hamburg), 2/3/2003; Stern, 8/13/2003] Indeed, El Motassadeq goes to an al-Qaeda training camp in Afghanistan (see May 22 to August 2000). 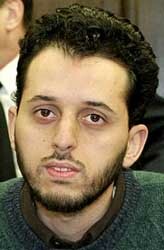 Al-Qaeda Hamburg cell member Mohammed Haydar Zammar is on a German watch list of suspected Muslim extremists before 9/11, the Washington Post will later report. However, more details, such as when he is placed on the watch list, are unknown. [Washington Post, 6/12/2002] Cell members Said Bahaji and Mounir El Motassadeq are also placed on a watch list, both of them in March 2000 (see March 2000).